Editor's Note: As Gordon Berg often reminds our group, there are books about related topics that Civil War buffs would enjoy. 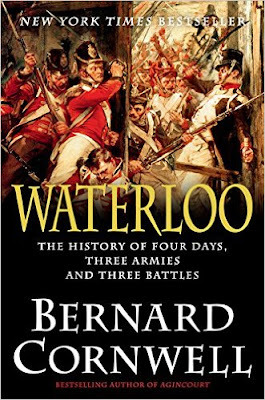 Consistent with that spirit, included is the following review of a book about the Battle of Waterloo, which provides a overview of certain misconceptions about the length of the war, the problems (and benefits) with Napoleonic tactics, and the key errors made in the movement of troops, some of which have analogues in the Civil War. As an initial matter, I recommend that you only buy the hardback edition. Don't even think of downloading it in electronic form. This is a gloriously handsome book with with far more color (excuse me, colour) plates and maps than in similar works. For example, it includes Lady Elizabeth Butler's "Scotland Forever" (see wikimedia/wikipedia link), though Cornwell explains it is inaccurate. Such "Saxon Tales" storytelling of a Napoleonic battle isn't for everyone; it is marred upon occasion by over-dramatic storytelling hardly necessary for the most consequential land battle of the first half of the 19th Century (and perhaps the entire Century). I have a feeling this book will annoy more knowledgeable readers, but it is a good basic introduction, and a wonderful reference for those of us old enough to have bookcases. 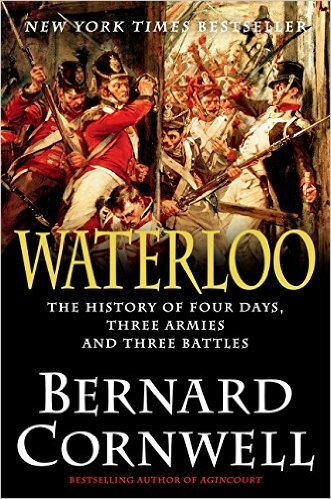 My prior familiarity with Waterloo came in two or three biographies of Napoleon. So I'll have to read another to see whether the pattycake approach obscured fact. For me, the key insight was Cornwell's "scissors, paper, stone" analogy ("rock, paper, scissors" in North America) to Napoleonic land warfare: cavalry could attack infantry, whose defense was the square, which was vulnerable to artillery--but to win, the timing of the attack had to be perfect. Napoleon's and Marshal Ney's wasn't. "They had expected a swift victory over the ragged armies of Revolutionary France, but instead they sparked a world war which saw both Washington and Moscow burned." "A few weeks before Waterloo[, the Duke of Wellington] was walking in a Brussels park with Thomas Creevey, a British parliamentarian, who rather anxiously asked the Duke about the expected campaign. A red-coated British infantryman was staring at the park's statues and the Duke pointed at the man. 'There', he said, 'there. It all depends upon that article whether we do the business or not. Give me enough of it, and I am sure.'" French officer Captain Pierre Cardon was summoned along with all the infantry regiment. The stood in two ranks "asking each other what was going on? What was there? In the end we were filled with worry. [Then, his Colonel appeared] holding in his hands, what? You would not guess in a hundred years. . . Our eagle, under which we had marched so many times to victory and which the brave Colonel had hidden inside the mattress of his bed. . . . At the sight of the cherished standard cries of 'Vive l'Empereur' could be heard; soldiers and officers, all overwhelmed, wanted not only to see, but to embrace and touch it; this incident made every eye flow with tears of emotion… we have promised to die beneath our eagle for the country and Napoleon." Napoleon believed he could push the Prussians around, then turn his attack to the British. It was all going to plan and the Emperor would take breakfast in Brussels's Laeken Palace on Saturday morning. “Except Ney had still not captured Quatre-Bras." Facing two conflicting orders, D'Erlon assumes that Ney is in the more dire straits, so turns his Corps around and retraces his steps for Quatre-Bras. The Emperor launches his great attack, but by the time he realizes d'Erlon is not engaged, the 1st Corps has vanished. Many say Waterloo was lost because 22,000 men spent Friday marching between two battlefields and helping neither. D'Erlon “could have swung either the battle at Ligny or the fighting at Quatre-Bras, had achieved nothing. It is the French equivalent of the Grand Old Duke of York, except d'Erlon spent his day halfway between two fights, neither up nor down, and his prevarication denied Napoleon the crushing victory he expected." "[The Duke of Wellington] was not loved as Blücher was, nor worshipped like Napoleon, but he was respected. He could be sharply witty; long after the wars were over, some French officers pointedly turned their backs on him in Paris, for which rudeness a woman apologized. 'Don't worry, Madame,' the Duke said, 'I've seen their backs before.'" At Hougoumont, Macdonell, saved the Allied right flank by realizing that killing Legros, the French Sous-Lieutenant who axed-open the door to that house, was irrelevant. The key to the fighting was to shut the gate, denying entry to any more of the French. So he and a small group bypassed Legros and his men and forced the huge gates shut. The heaved against the pressure from outside while Legros tried to kill them inside. “Wellington once remarked that closing the gates [at Hougoumont] was the decisive act of battle and, later, when an eccentric clergyman wanted to arrange an annuity for 'the bravest man at Waterloo' and requested the Duke to make such a difficult judgement, Wellington chose Macdonnell. Macdonnell, in turn, insisted on sharing the money with Sergeant James Graham, an Irishman who had been at his side in those decisive moments, the pair did receive the annuity for two years before the generous clergyman lost his money, but it is significant that Wellington, forced to make a decision, nominated Macdonnell and, by association, Graham." At his point, Napoleon now faces a dilemma. Wellington's army is in front of him, and he knows a heavy force of Prussians was approaching to his right. The two, together, greatly outnumber him. Yet he still thought he could defeat them in detail. “This morning we had ninety chances of winning,' the Emperor told Soult, 'we still have sixty." French cavalry climbed the crest of the ridge, and they may have thought victory was imminent—bodies lay everywhere, and an enormous baggage train was heading toward the rear. But then redcoats popped up from below the military crest of the ridge – a Wellington favorite – and formed square. This was almost perfect protection from cavalry, but vulnerable to French infantry volleys. Scissors, paper, stone. And then the British cavalry joined the battle. "[T]hat was the great disadvantage of the formation the French had chosen to use. A column made of successive battalions in line looked magnificent and, given the chance, might have spread into a formidable line to give devastating volley fire, but it would take a battalion in a three-rank line a lot of time to form square, and they would be hammered by the battalions in front and behind while they did. There was neither space nor time to form square. Major Frederick Clarke, who charged with the Scotland Greys, reckons the enemy was trying to form square, but 'the first and nearest square had not time to complete their formation, and the Greys charged through it.' So the British heavy cavalry drove into the panicking columns and [Louis] Canler tells what happened: ' A real carnage followed. Everyone was separated from his comrades and fought for his own life. Sabers and bayonets slashed at the shaking flesh for we were too close packed to use our firearms.' . . .There was no time to form square, so his unit was cut to ribbons." Artillery could have smashed the British squares, had Ney managed to bring more guns close to the line, or deployed French infantry. “That was the scissors, paper and stone reality of Napoleonic warfare. If you could force an enemy to form a square you could bring a line of infantry against it and overwhelm it with musket fire, and very late in the afternoon Marshal Ney at last tried that tactic, ordering 8,000 infantry to attack the British squares. . . Their task was to deploy into line and then smother the British squares with musketry, but the British would only be in square if the cavalry threatened and the French cavalry was exhausted. They had charged again and again, they had shown extraordinary courage and too many of them were now dead on the hillside. There was no charge left in them." Eight thousand men were defeated at best, dead at worst, in minutes. The French fled down the slope, away from Waterloo, bypassing dying men and horses, and grounds littered withed discarded cavalry swords, scabbards and breastplates. And blood. After that, the famous French "Imperial Guard” tried its turn, but also was too late. The charged straight up the center of the hill, to win or die. "Wellington rode back towards the centre of his line. Leeks had seen him just before the 52nd marched out of line to destroy and Emperor's dreams. The Duke's clothes, Leeke said, 'consisted of a blue surtout coat, white kerseymere pantaloons, and Hessian boots. He wore a sword with a waist belt, but no sash.' The plain blue coat and black cocked hat made Wellington instantly recognizable to his men, and now, as the French began to flee, he watched from the ridge's centre for a few moments. He saw an enemy in panic, a retreating enemy that was dissolving into chaos. He watched them, then was heard to mutter, 'In for a penny, in for a pound'. He took off his cocked hat and men say that just then a slanting ray of evening sunlight came through the clouds to illuminate him on the ridge he had defended all day. He waved the hat towards the enemy. He waved it three times, and it was a signal for the whole allied army to advance." Waterloo was an allied victory. Wellington would never have stood his ground had he not thought the Prussians would appear at his left wing. Blücher would never have marched over rock and stream had he thought Wellington would cut and run. True, the Prussians were late to the party, but that turned out well for the Allies, fooling Napoleon into believing he could defeat each army in detail. As it turned out, when the Allied forces joined, “The Emperor was not just defeated, he was routed." "An easier question to answer than 'who won the battle?' Is 'who lost the battle? ', and the answer must be Napoleon. The Duke and Blücher both offered leadership, but Napoleon left the conduct of the battle to Marshal Ney, who, though braver than most men, did little more than hurl troops against the most skillful defensive general of the age. The French had the time and the men to break Wellington's line, but they failed, partly because the Duke defended so cleverly, and partly because the French never coordinated an all-arms assault on the allied line. They delayed the start of the battle on a day when Wellington was praying for time. They wasted men in a time-consuming assault that lasted much of the afternoon. And why Napoleon entrusted the battle's conduct to Ney is a mystery; Ney was certainly brave, but the Emperor damned him as 'too stupid to be able to succeed', so why rely on him? And, when the French did achieve their one great success, the capture of La Haie Sainte, which enabled them to occupy the forward slope of Wellington's ridge, the Emperor refused to reinforce the centre and so gave the Duke time to bring up his own reinforcements. Finally, when the Imperial Guard did attack, it was too few and too late, and by that time, the Prussians were on the French flank and threatening their rear." That’s Corrwell’s story of Waterloo—Rock, Paper, Scissors. And timing. This is no book for a Napoleonic expert. But an excellent start for anyone wanting to dip a toe into the end of the last great French vs. Britain war.